Plenty who have attented Mammothfest before will know the kind of carnage that unfolds on each day at the festival. For those who have never been before, you can now get a taste of what to expect across the weekend as Mammothfest has unveiled footage from previous events. There are four videos to watch, from the "weekend" video with a preview of everything you can experience at Mammothfest over the three days, to the separate videos of daily themed footage. This includes the Friday, which is the "Black Metal Day", headlined by Rotting Christ. The Saturday, headlined by Fleshgod Apocalypse, a day packed with a variety of extreme styles in metal. Finally, the Sunday "Doom Metal Day", headlined by Amenra. All headliners are exclusive to Mammothfest in 2017! This is the perfect way to either relive your previous experiences of the festival or get your first glimpse of the expected fun and chaos that is destined to be had in 2017. 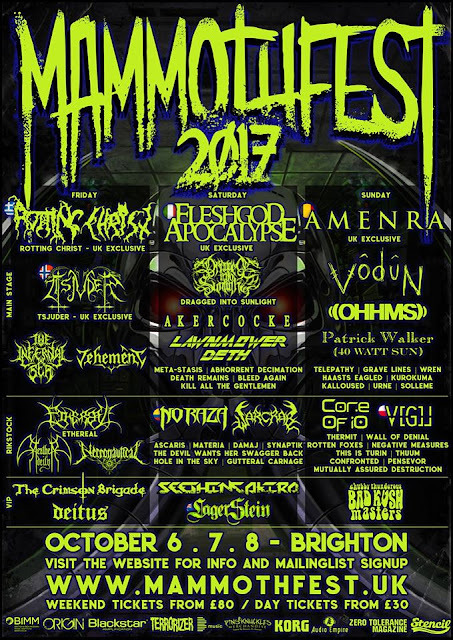 Mammothfest 2017, which is held at The Arch in Brighton from October 6th to October 8th is not to be missed and was recently featured in Metal Hammer (UK) in the festival preview last month under the 'best metal action at UK festivals'. See why in the trailers below! Even though we haven't even reached Mammothfest 2017 yet, the festival organiser, Steve Dickson, has been thinking ahead to where this festival can be in two years time if 2017 is a success. Currently, Mammothfest is a metropolitan style festival and has been since the beginning, but the goal has always been to push the festival to become an open air event. 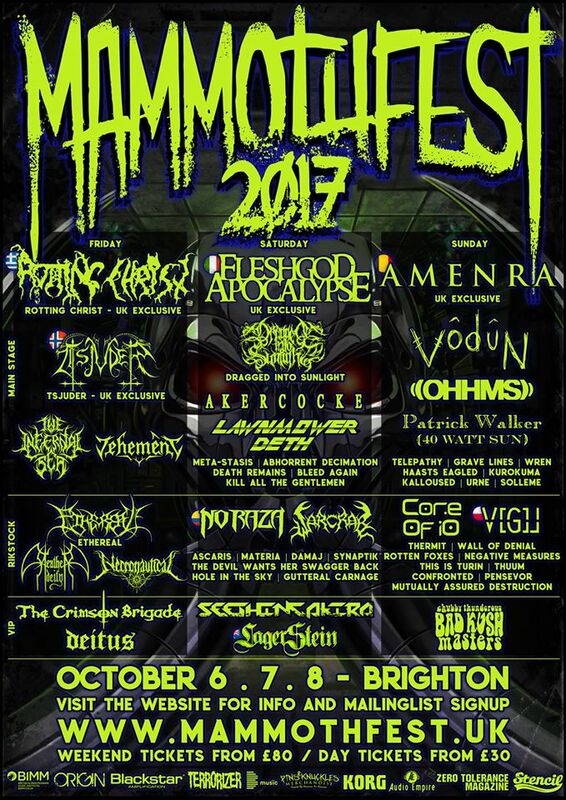 With the likes of Hevy Fest and Sonisphere no longer options for open air festivals in the South of the United Kingdom, along with Download and Bloodstock further up the country, it is a strong desire for Mammothfest to tap into the demand of an outside festival for heavy music in the south. Each year, Mammothfest grows as an event and that target is getting closer, to the point that in just a couple of years this can be a reality. We want customers to be a part of history, to be the tipping point that could very well turn a possibility into an absolute certainty. In 2019, our hope is that for everyone involved in Mammothfest, from the organisers to paying customers to be able to say "We made Mammothfest what it is today". Let's sell this year out and make what was once a pipe dream come true! The director Steve Dickson comments "It has been our dream from the start to become an open air festival. We have the site and plans are coming together very nicely, we just need to hit our targets each year and this will become a reality. This is why it is so important that everyone gets behind us including press, sponsors, customers and the bands; (not because we are greedy for money, every penny gets reinvested into growth) because we want to provide a metal festival in the South so people don't have to travel for so many hours to go and see their favourite bands. Not only that, we have some insanely cool ideas that will ensure Mammothfest becomes an incredible weekend experience for all. All of us at Mammothfest urge everyone to secure your tickets ASAP and be a part of history. A huge thank you goes out from the team and I for all the support we have got to date! See you all at Mammothfest 2017!"